It turned out to be a “black” Diwali for 99 persons, who reported at local hospitals from the city and adjoining areas with eye and burn injuries during the festival of lights yesterday. The Municipal Corporation (MC) did not leave any stone unturned to gift a black Diwali to city residents, especially those living in southern sectors. Diwali celebrations kept the Chandigarh police on its toes with 271 calls relating to brawls and bursting of crackers after the stipulated time of 10 pm received at the Police Control Room (PCR). Only 63 calls could be verified by the police teams on reaching the spot. Vishwakarma Day was celebrated with religious fervour and gaiety in the city on Thursday. A large of mechanics worshipped their tools to mark the occasion. The Vishwakarma Temple at Palsora drew a huge crowd throughout the day. The city recorded an incident of stabbing for a mere Rs 2,500 along with two other robbery incidents involving sums of Rs 8,000 and Rs 4,000 and a mobile phone, all in the jurisdiction of a solitary police station over Diwali eve (Tuesday) and Diwali day (Wednesday). Showcasing illegality in official proceedings and causing public harassment due to procedural wrangling has been highlighted in a severe reprimand that the estate office of the UT Administration recently received at the hands of a local consumer court. An irregularity, bordering on a possible scam, involving several lakhs of rupees in the local Registration and Licensing Authority (RLA) office has reportedly been detected during checking of its records recently. City residents were relieved, as this Diwali witnessed lesser fireworks last night. The residents of many areas like Kaimbwala, Sector 38 and certain northern sectors claimed that the duration as well as the intensity of bursting of crackers was comparatively low last night than that of last few years. As many as 31 cases of minor incidents of fire were reported on the occasion of Diwali yesterday. The figure is nearly double of last year. Records of the fire department reveal that against 31 minor cases of fire this year, only 16 incidents were reported last year. The fire brigade personnel of the district remain on tenterhooks, as 14 calls of fire incidents, including 12 at Panchkula, were reported on Diwali night. During Diwali celebrations, the Mohali Police control room (PCR) received as many as 19 calls from frantic residents complaining about their neighbours bursting crackers even after 10 pm. Agitating employees of the Punjab Health Systems Corporation (PHSC) observed a “Black Diwali” on the office premises here yesterday, with employees from other districts also participating in the protest. A 35-year-old resident of Dadu Majra died after receiving burn injuries due to a stove blast at his house on Wednesday. A young life was snuffed out, while a pedestrian was injured in two separate accidents on Wednesday. Ward number 3 comprises centrally located Sectors like 16, 17 and 22 and faces problems such as encroachments and shortage of parking space in markets. The ward depicts a lack of coordination between different departments of the MC. Recently, paver blocks were laid in Sector 22 after a fortnight. Finding it a nuisance, residents of Sector 10 have requested the district administration to shut down a newly opened hukka bar in the market. The presence of the hukka bar right in the middle of the market, which has a large number of coaching centres, is resulting in rowdyism and clashes in the locality, said B B Singhal, a resident and former vice-president of erstwhile Panchkula municipal committee. The recently laid paver blocks that were dug up by the MC electricity wing in Sector 22, Chandigarh. (Right)Work under way at the rear of Sector 16, Chandigarh. 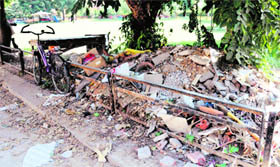 Sector 70 — Residential area or a dumping site? Despite being one of the newly developed sectors of Mohali, Sector 70 suffers as it is located next to Matour village. Ever since the sector was conceived, open spaces between historic Matour village and residential parts of the sector are being used to dump garbage. A village pond that has literally dried up is also being used to dump garbage and debris. Residents of Mohali had a safe Diwali this year as only two eye injury cases were reported from the town apart from minor fire incidents. The Zirakpur municipal council is all set to have a new building. Come November and the work will begin. In fact, foundation stone of the building is to be laid in the first week of November. Continuing with their pen-down strike, members of the Council of Diploma Engineers from Punjab, Himachal Pradesh and Chandigarh today started the chain hunger strike in front of the Hydel Building of Punjab Irrigation Department in Sector 18 here. Pulling off a brilliant show, Jagleen Kaur, an MBA 4th semester student of University Business School (UBS), PU Regional Centre, Ludhiana, has secured first position in the combined Panjab University merit list of MBA fourth semester, the result of which was declared by the PU recently. The city art lovers were treated to a rare treat of bharatnatyam Indian classical dance at the second International Dance Festival organised by the Indian Council of Cultural Relations (ICCR) and Punjab Arts Council at the Randhawa auditorium here today. Awarded The Bhakra Beas Management Board (BBMB) has won the Corporate Greentech Social Responsibility Award-2011 in the hydropower sector. The award has been given in recognition of the BBMB having made positive impact and difference on the lives of people around and to the communities in which they were active through their outstanding and innovative CSR programmes. The award was presented at Srinagar by Nawang Rigzin Jora, Minister of Tourism and Culture, Jammu and Kashmir government. The UT education department and private schools may have principally agreed on reserving 25 per cent of seats under the Right of Children to Free and Compulsory (RTE) Education Act, but the duo are yet to reach a consensus over financial modalities. Patiala residents celebrated Diwali in a big way. The entire city donned a festive look and markets were abuzz with activities even on the day of Diwali due to manifold increase in the demand of crackers and gift items. Vehicle owners are at the mercy of officials of the DTO’s office and facing a lot of harassment as well as financial losses for getting their new vehicles registered due to contradictory instructions issued by the state government and transport department on depositing motor vehicle tax (MVT). The Indian Post office Department has launched a novel scheme for the general public by announcing a rebate of 5 per cent on buying gold coins from post offices. Having a roof over one’s head is a fundamental right guaranteed to the citizens of India under Article 21 of the Constitution of India. Citing this, the Panchkula District Consumer Disputes Redressal Forum has directed a builder to pay a compensation of Rs 5 per square foot per month to the complainant on 1,800 square feet, the super area of the apartment on account of delay of possession of flat. The District Consumer Disputes Redressal Forum-I slapped a fine of Rs 15,000 on an immigration firm, Canin Worldwide Consultants Private Limited, for its failure in providing work visa within six months to a resident of Nawanshahr. A conman was nabbed by security staff of Government Medical College and Hospital, Sector 32, (GMCH) when he was trying to fleece a patient admitted at the medical emergency ward here today. Tightening its noose around the immigration firms, which are duping people on the pretext of sending them abroad, the Chandigarh Police registered another case against a Sector 34-based immigration firm, AKME Carrier World, on the complaint of Rajnish Anand hailing from Punjab for duping him of Rs 9 lakh. A dismissed Punjab Police constable was booked by the Chandigarh Police for firing several rounds in the air from his licenced gun during Vishvakarma procession today at Dadu Majra. A 45-year-old man was found dead under mysterious circumstances near railway tracks at Dhakoli village here this afternoon. The deceased was identified as Rajinder Singh, a resident of Dhakoli. The Stepping Stones Cricket Academy and DP Azad Cricket Academy register win in their respective matches of the ongoing 2nd St Stephen Junior Cricket Championship for Boys (U-12) being held on the school premises here today. The Gatka Federation of India (GFI) is organising its first National Gatka Open Championship (Men and Women) at Akal Degree College Mastuana Sahib, Sangrur, from November 11 to November 13. Earlier the championship was scheduled to be held from October 28 to October 30. A brilliant ton by Abhimanyu Khod (102) and Sandeep Bhattacharjee (62) helped Haryana team to draw their plate group match against Vidarbha during the Col CK Nayadu Cricket (U-22) Trophy here. 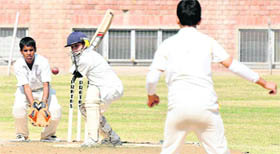 Earlier, Haryana team was bowled out for 336 runs while chasing the target of 580 runs.In their second innings, Haryana team scored 220 runs to draw the match. Jaideep of SGGSPC-26 secured the first position, Nirmal of GMSSS-Mani Majra finished second, while Ankaj Behal of GSSS-27 and Naveen GMSSS-8 managed to secure third position in the below 44-kg category of the Inter-School Kick-Boxing Tournament being held here. Government Model Senior Secondary School, Sector 35, defeated Government Model Senior Secondary School, Sector 40, by 18 runs during the ongoing T-20 Inter-School Cricket Tournament for Boys being held at Government Model Senior Secondary School, Sector 19, here. Aasish Nain, Gurmej Singh and Vikram Brar won top spots in the men’s singles scull event of the Chandigarh State Junior Rowing Championship for boys and girls held at Sukhna Lake Club here. Winner Aasish Nain bagged a gold medal after completing the course in 4:37.80 minutes, while Gurmej Singh bagged the second place and Vikram Brar finished third after completing the race in 4:52.01 and 5:16.18 minutes, respectively. An unbeaten ton by skipper Manan Vohra helped the Punjab team defeat Jammu & Kashmir in the ongoing Vinoo Mankad Trophy North Zone league match played at Delhi.